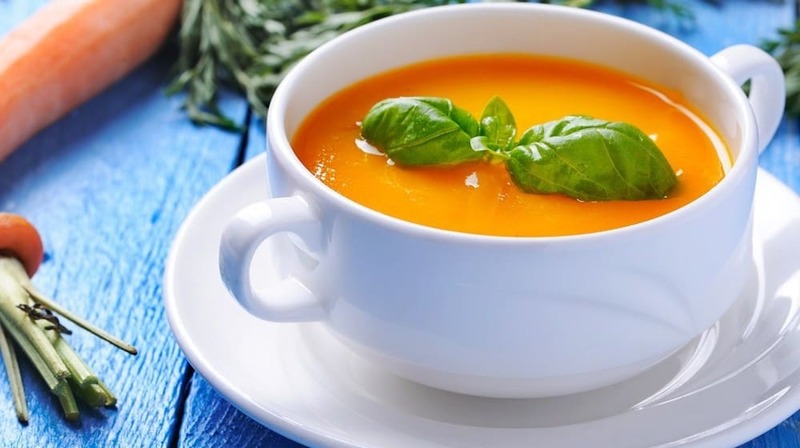 Here’s a spicy carrot soup recipe, full of antioxidant rich vegetables and herbs. It makes for a great tasting meal to warm you up in the colder months, but it’s also extremely good for you, especially your eyes and skin. Each ingredient below will help to explain why. You’ll need a vegetable steamer and a good blender to make this soup properly, but these are essential ingredients in your kitchen for healthy eating anyway. This recipe serves 2 hungry people. Just double the amount for four or to make enough for lunch the next day. Carrots are rich in antioxidants like beta-carotene and alpha carotene, high in potassium and other minerals and contain the compound falcorinol that is being studied for its anticancer properties. They are also unfortunately one of the vegetables really worth buying organic since they tend to absorb pesticides from the ground they are grown in. Bell peppers are a great source of vitamin C and a variety of free radical quenching carotenoids. Look for orange or red colored bell peppers were possible as these have been shown to have more zeaxanthin, which is closely tied to eye health and better vision. Onions are an excellent source of healthy polyphenol flavonoids like quercetin. Most of these can be found in the outer layers so try and avoid over peeling them. Putting your onions in the freezer for 10 minutes before you chop them will help prevent tears as well. Celery is high in vitamin K for proper blood clotting and healthy bones, natural silica for beautiful skin and a surprising array of antioxidant phytonutrients. It is a heavily sprayed crop though so soak it in hot water and vinegar and scrub it well if you can’t find organic. Bok choy is becoming more popular and readily available but any similar cabbage like green can suffice. Bok choy itself is a great source of pro-vitamin A carotenoids, vitamin C, vitamin K, potassium, selenium and folic acid. And with its subtle flavour it’s well worth adding to your meals wherever you can. Be careful not to touch your eyes or other sensitive areas after handling chilies. Some people wear gloves or use dried chili flakes, but real chilies have a much better flavor and kick. They’re also full of capsaicin, a substance known to reduce inflammation, boost immunity, benefit your cardiovascular system and generally make you feel really good. A powerful anti-inflammatory, turmeric contains curcumin which has strong anticancer properties. It also turns this soup a brilliant bright orange. Avoid getting it on white tablecloths or t-shirts though. Most curry powders are a mixture of cumin, coriander, fenugreek, turmeric, cardamom, ginger and other spices. While in small amounts, these are all powerful health promoters. A good curry powder adds a great burst of extra flavor to this carrot soup as well. Peel and squash these with the flat of a knife to release the allicin that helps lower the risk of oxidative stress to your cardiovascular system. Garlic is a natural antibiotic and contains a wealth of other nutritional compounds with health benefits far too long to list here. The cloves can be chopped up a little but the blender will do most of the work. While it smells great fried, it’s best not to heat your garlic for too long if you want to keep its beneficial compounds intact. It can be a good idea to serve this soup with an extra wedge or two of lime for anyone who might not like their soup as spicy as you do. Aside from being full of vitamin C and other nutrients, lime juice will actually soften out the initial strength of the chili. The more lime juice you add to this recipe, the gentler the chili kick. Ideally, look for one that is made from fermented anchovies only, with just a little salt for curing and no numbered additives. While probably the least healthy ingredient in this recipe, a good fish sauce gives an amazing balanced flavor to many Asian dishes. Alternatively, a true fermented soy sauce could be used instead to make this dish vegetarian. Bisphenol-A or BPA is a xenoestrogen found in most canned products with such serious health questions surrounding it that even the glacial moving FDA has banned its use in babies products. Many health experts are concerned about this endocrine disrupting chemical, but BPA-free canned products like Native Forest’s coconut milk are now being produced and are well worth getting in bulk as much healthier alternatives. Coconut milk gives this carrot soup recipe a really smooth and creamy texture. Some people are worried about the fat content of coconut milk but, as explained in coconut oil ahead, it’s a healthy fat that satisfies you and stops hunger dead in its tracks. While coconut oil is high in saturated fat it’s not as simple as that. Studies have shown that its medium chain triglycerides like lauric acid can actually increase your bodies levels of ‘good’ HDL cholesterol. Additionally, coconut oil enhances cholesterol conversion to pregnenolone, a precursor to the creation of many vital hormones for better health. Coconut oil also improves blood sugar control and helps burn abdominal fat. Don’t be afraid of healthy fats like coconut oil. They are very good for you. I consider it to be one of the best cooking oils there is and far superior to inflammatory corn, soy, cottonseed or canola oils. Now we have all (or at least most) of our healthy ingredients, let’s get started! Bring 3 cups of water to boil in your steamer saucepan and steam your chopped carrots for 10 minutes with the lid on. While the carrots are steaming, use another saucepan to lightly fry the onions in the coconut oil on a low heat. If you have a lid for this saucepan the onions will cook through quicker and there will be less of the gas that makes your eyes water in the kitchen air. Once the onions are clear, add the garlic, turmeric, curry powder, fish sauce and chili. Stir together and then add the coconut milk over the top of them. Mix well and leave to simmer on a very low heat. At the 10 minute mark, add the celery, bok choy and bell pepper (insides facing up) to your steamer and steam for a further five minutes. The vegetables are ready with a fork goes through the steamed carrots easily. Pour the bright yellow onion and coconut mixture straight into your blender. I would only ever use a blender with a glass mixing jug, but if you have a plastic one it would be best to let it cool a bit before adding it. On top of this, spoon into the blender all of the vegetables from your steamer and add a little of the steamer saucepan water until the liquid in the blender is about a third of the way up to the vegetables. Finally, add the lime juice directly to the blender and blend it all up on high until you have a smooth and creamy consistency. Pour your soup straight from the blender into bowls and serve immediately, piping hot and delicious. I’d really appreciate reading what you think in the comments below if you make it up for yourself. Or any suggestions you might have as to how to make the spicy carrot soup recipe even healthier.